Small-Time Winners and a Mighty Mistake: "Small Time Crooks," "Center Stage," and "Dinosaur"
Woody Allen's latest offering is such a light and enjoyable work that it's bound to be underrated, to be seen as a throwback to the "early, funny" movies that Woody fans hold such a fondness for. And yes, it has some of the go-for-broke spirit that energized movies like Sleeper and Bananas, and some of the same slapstick silliness, too. But it's much more than that; Small Time Crooks is a major achievement. It's a comedy with a tricky, unpredictable narrative, it features topnotch character performances and wickedly funny one-liners, and like Woody's way-underrated Manhattan Murder Mystery, it display a shockingly healthy and vibrant view of long-term marriage. All this, and it has an incredibly rich visual design, courtesy of the brilliant cinematographer Zhao Fei. The movie is bliss. Detailing too much of the plot is to give away its many surprises, but here's the upshot: Ray (Allen) and Frenchy (Tracey Ullman), his wife of 25 years, are a lower-middle class couple trying to find a way out of their blasé lifestyles; Ray's solution is a bank heist. With the aid of three dimwits (Michael Rapaport, Jon Lovitz, and Tony Darrow), Ray plans to tunnel into a bank vault by using Frenchy's next-door cookie store as a front. Needless to say, nothing goes as planned, but Ray and Frenchy soon find themselves the beneficiaries of financial riches, and the film follows their adventures as their natural tackiness collides with New York's cultural elite. 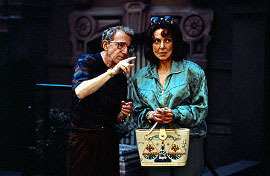 The one thing Allen never gets proper credit for in his comedies is how cannily he plays with traditional narrative, and how readily he'll shoot off into directions you didn't foresee the movie going in - think Jennifer Tilly's demise in Bullets Over Broadway and Julie Kavner's appearance in the "Oedipus Wrecks" segment of New York Stories. When Small Time Crooks makes its first narrative switch, it's both logical and totally unexpected, and every time the film goes in a new direction that surprises you, it seems like the most obvious path in the world. Woody is almost without peer in really thinking his movies through, which accounts for their sometimes stilted quality, but which can occasionally work like a dream, as it does here. The storytelling and jokes alone would make the film worthwhile, but the cast performs some wonders, too. Allen and Ullman are a sensational team; their verbal battles are timed so perfectly that they truly seem like they've been having these same squabbles for twenty-five years, and their down-deep love for each other registers just as strongly. (With the exception of Diane Keaton, Ullman is the best foil Allen's ever had.) And among a peerless supporting group that includes Hugh Grant, Elaine Stritch, and George Grizzard, particularly great work is offered by Elaine May as Frenchy's numbskull cousin; she lives in a wonderfully loopy world all of her own, and you're happy to join her there. Crooks may seem small-time, but it's a comedy of rare artistry and skill, and easily the best movie released yet this year. A dance movie can get away with a lot, primarily because dancing can be such an intoxicating, cinematic activity, and also because there just aren't enough movies that contain any dancing at all. The latest entry in the genre, Center Stage, is mostly terrible, but the performers and director Nicholas Hytner get many of the dance sequences so marvelously right that you can have a pretty damned good time at it nonetheless. The plot is your standard miasma of dance-movie clichés: it takes place during the first in-residence year at a prestigious New York City ballet school, where a group of hopeful stereotypes (plucky ingenue, cocky star-in-training, bulimic mama's girl, token homosexual) follow their dancing dreams and find romance, often against a group of equally stereotypical authority figures (smarmy director, uncomprehending parents, tough-as-nails instructor). And it ends, of course, with the Big Dance. Who's gonna make it? You won't be surprised by the results, nor by any of the laborious plot "twists," nor by the generally flat acting of the dancers-cast-as-actors-cast-as-dancers. But very little of that matters in the end, because Center Stage does well by its dancers and its commitment to their passion, and Hytner knows where to put the camera to give the audience a charge. Even when the choreographed numbers border on the awful (that Big Dance, with its lightning-fast changes of wardrobe and scenery, is close to a howler), you can get tremendous enjoyment out of their performance - especially the work of Ethan Stiefel, whose brilliance on stage looks effortless. And thankfully, there are so many dance sequences on hand, both on stage and in rehearsal, that you can quickly shuffle the stuff that's not working in the flick out of your mind. In the end, Center Stage has worked its magic on you, embarrassed as you are to admit it; it's silly and predictable, and still a kick. I would call Disney's Dinosaur "rampagingly mediocre" if the movie wasn't so obviously pleased to be rampagingly mediocre. That makes it even worse. Yes, yes, the digitalized effects are generally wonderful, even if viewing them against real-life backgrounds takes some getting used to. But that's exactly where the accolades stop. Once the characters open their mouths and the plot kicks into gear - which happens after a blissfully wordless prologue, a la last year's Tarzan - everything goes to hell. I hate beating a dead horse, but am I the only one who can't bear to watch the same tired, hackneyed Disney formula in movie after movie? 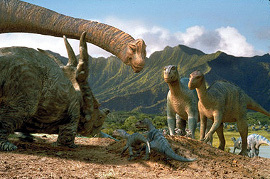 We're spared the inconsequential, Oscar-baiting songs this time around, but here's a short list oft hings I never want to see in another Disney film, all of which Dinosaur contains: an orphaned mammal adopted by a species that's not his own; a drawn-out trek to a "better world" that basically features a lot of foliage and a lake; "hipster" supporting animals that make lame jokes; shots of the hero and his girlfriend nuzzling against an intolerably cutesy musical score; present-day references in a years-ago setting; the token battle between our animal hero and the misguided leader of the animal hordes. Take all this plus a mostly uninspired vocal cast (I don't much care for D.B. Sweeney, Della Reese, and Max Casella as live actors, either) and you have the worst animated Disney film in over a decade-and-a-half, and one I'm convinced the Disney folk are looking at with pride. It's the true Disney formula: slap modern-day technology on something older than dirt and call it new. The big bucks Dinosaur is raking in prove the adage: There is a sucker (and far more than one) born every minute.